EIFS is a professionally installed exterior cladding syste m that is layered to incorporate water management, continuous insulation, mesh reinforced base coating and a tinted acrylic finish coat. Using polystyrene insulation not only vastly improves thermal performance, but also lets designers creatively incorporate accents and ornamental shapes made on CNC cutting machines. 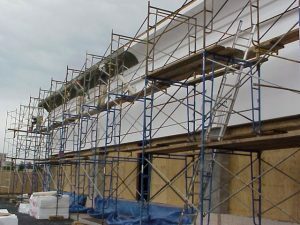 EIFS manufacturers have strict requirements for the continuous insulation used with their branded systems. Polar’s AccelerAged™ EIFS grade EPS is stability conditioned in our hot rooms. These rooms are kept at 140°F continuously for 120 hours to ensure consistent high quality and conformance to manufacturer or EIMA specification. In fact the thermostats in our rooms are monitored 24 hours a day, 365 days/year. This is your assurance of fully cured, completely stable rigid insulation. With over 30 years of industry experience we have the quality control systems in place to provide consistent quality, ensuring each panel is cut to exact tolerances and reliable uniformity. So you can be sure that 1” means 1” not something close to it, and square is true 90 degrees. AccelerAged™ EPS is sold exclusively through recognized EIFS distributors. Contact Polar for distributors in your area.